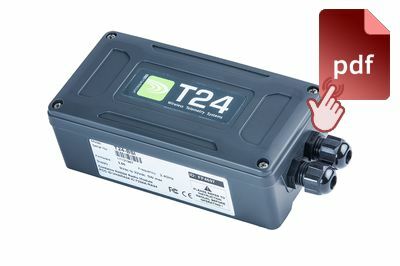 The industrial radio base station is required for the configuration of all of the T24 modules and is greatly simplified by the T24 Toolkit software for Windows supplied free of charge upon purchase. Data can also be captured by the base station from an unlimited number of T24 acquisition modules to provide a radio telemetry data logger. The options of USB, RS232 or RS485 interfaces enables this base station to connect to a wide range of devices such as PCs, PLCs, OEM hardware etc.The internal antenna provides up to 800m (2600 ft) range. For software developers a standard Windows DLL and COM driver are available to enable data collection from T24 Acquisition modules. The licence free 2.4GHz direct sequence spread spectrum (DSSS) radio telemetry technology offers high integrity, error free communications which can co-exist with other wireless technologies such as Wi-Fi, Bluetooth® and Zigbee®. ETSI, FCC and IC approvals. *Maximum range achieved in open field site at height of 3 metres (9.8 feet) above ground.